HONOLULU (AP) — President Donald Trump has approved Hawaii's request for a major disaster declaration for areas affected by Hurricane Lane. The National Weather Service has dropped all warnings for tropical storm Lane, saying it is now moving away from Hawaii. The weather service said Saturday the storm has turned west, reducing the threat to the state. Lane had been a Category 5 hurricane just a few days ago but has been steadily weakening as it neared the islands. HILO, Hawaii (AP) — Big Island officials have delayed two road projects and a bus route expansion following the expenses created by Hurricane Lane. The Hawaii County Council approved a revised budget Wednesday, reallocating the $10 million expected next year from the new surcharge on the state general excise tax, West Hawaii Today reported . HILO, Hawaii (AP) — The damage to Hawaii County facilities from the flooding caused by Hurricane Lane's torrential rains totaled about $20 million, an official said. The figure is only for county infrastructure and doesn't include damage to state infrastructure such as schools and highways, county Managing Director Wil Okabe said Thursday. A damaged culvert adjacent to the county's Mohouli Park in Hilo alone is estimated to cost $400,000, Okabe said. HONOLULU (AP) — Emergency managers studied the operations of Hawaii's wholesale grocers in preparation for Hurricane Lane instead of just bringing food and water to the islands. Federal Emergency Management Agency Administrator Brock Long says they researched how many days' worth of food was already in the state. The National Weather Service is downgrading a hurricane that has been threatening Hawaii for most of this week to a tropical storm. But meteorologists warned Friday that heavy rains from Tropical Storm Lane could still bring more flooding and damaging winds to the island chain. Lane was packing maximum sustained winds close to 70 mph (110 kmph) as it churned slowly west toward Oahu. 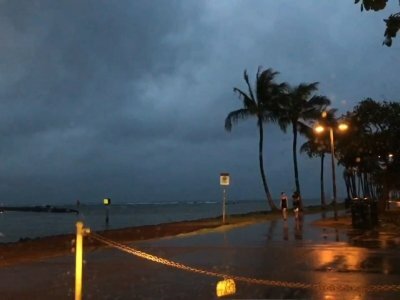 HONOLULU (AP) — Hurricane Lane unleashed torrents of rain and landslides that blocked roads on Hawaii's mostly rural Big Island on Thursday as residents and tourists in the state's biggest city braced for the dangerous storm to come their way. Emergency workers rescued five people from a flooded house in Hilo after a nearby gulch overflowed, said Hawaii County Managing Director Wil Okabe. They weren't injured and were taken to a shelter, he said. Meteorologists are downgrading the Big Island of Hawaii to a tropical storm warning as Hurricane Lane edges northward toward Honolulu. That means the National Weather Service expects sustained winds of 39 mph to 73 mph on the island instead of stronger hurricane force winds. A hurricane warning remains in effect for Oahu and Maui County. Emergency workers rescued five people from a flooded house on the Big Island. HONOLULU (AP) — Hawaii residents emptied store shelves Wednesday, claimed the last sheets of plywood to board up windows and drained gas pumps as Hurricane Lane churned toward the state.